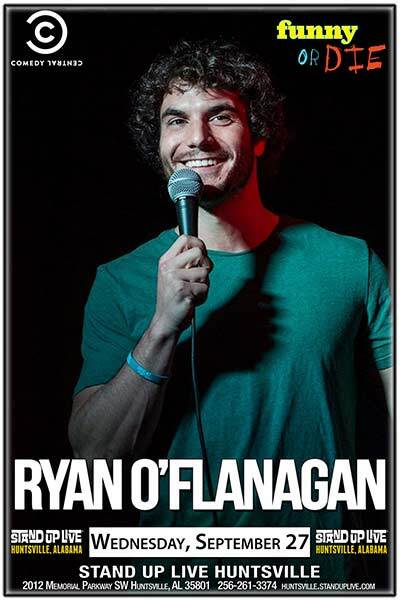 Ryan O’Flanagan is a stand-up, actor, and member of the sketch comedy group, Dead Kevin, which has been featured on Comedy Central Studios, Funny or Die, Huffington Post UK, BuzzFeed and shown regularly at Comedy Meltdown. He got his comedy start in New England, where he won the 2008 Rhode Island Comedy Quest before moving to LA. Ryan has appeared on Comedy Central’s Tosh.0, Fox’s New Girl, American Dad and was featured at New Faces at Montreal's Just for Laughs Comedy Festival. Ryan performs at colleges and festival around the country including JFL, Jashfest, Blue Whale, High Plains, KAABOO, RIOT LA, SF Sketchfest and the Bridgetown Comedy Festival. Ryan will appear on Netflix’s ‘American Vandal’ this upcoming fall and you can see his web series ‘Ryan Does’ currently releasing on Funny or Die every Monday.